Whether I am working with a 2D or 3D piece, I enjoy creating visual loops, lines, and values that unfold with the viewer. Below are two examples of my bi-stable pieces that can rest in either of two states. Bi-stable images were popularized in 1915 by Danish psychologist Edgar Rubin, with the “Rubin vase” illustrated below. My artwork is often inspired by my fascination with perception and my interest in juxtaposing different elements to compose one image. I explored similar ideas concerning double imagery with Mask W.L below. Mask Portrait (W.L). 2012| 22.5 x 18 x 7 inches| Bamboo strips, dirt, pastel, charcoal, wood, paper stretched over canvas bar. 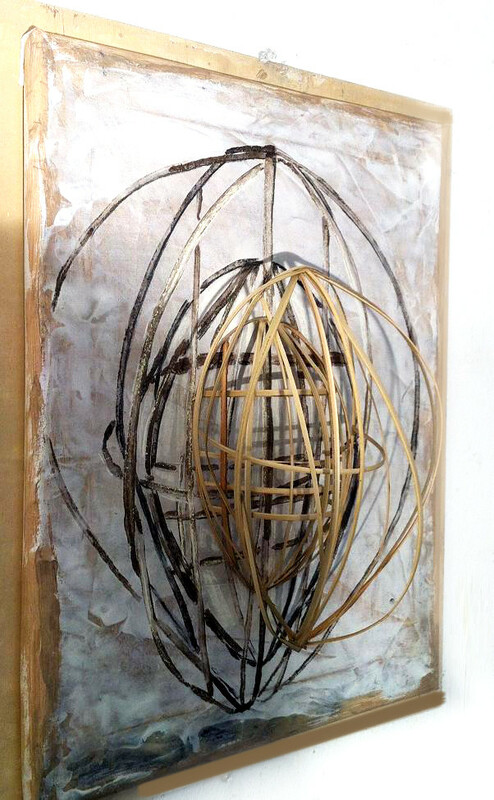 With “Mask W.L”, I drew a trompe l’oeil image of a mask and paired it with a mirroring bamboo sculpture. As always, I hope you enjoy looking at the two ways that I explore visual illusions and blend two forms to make one piece!